green tea: The Next Adventure: Iceland! Eighteen months of employment with only one vacation day taken: it's been a long haul for a wanderluster like me. Good news is, I've been granted five (unpaid) days off next month. Combine five vacation days with the two shoulder weekends and I've got nine days to play around with. Nine days isn't enough to travel to the part of the world I most love visiting (Asia) but there is one place not too far away that I've been dreaming of... Iceland! Home of exciting geology, Viking lore and a culture of knitters. This is gonna be awesome. It's also my first trip to a Nordic country. I'm doing a hiking tour around the west and south of the island with a couple of days in Reykjavik on either end. The tour will take me around Snæfellsnes Peninsula in the west and over as far as Jökulsárlón in the southeast. If nothing else, I should end up getting some decent exercise in fresh air and some more content for this blog. Three weeks from tomorrow! 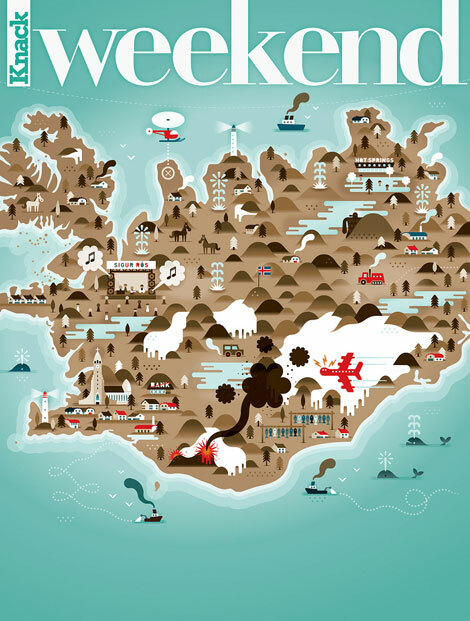 Illustrated Iceland map by Khuan Caveman Co. Check out their other gorgeous maps here. So exciting! A lot of people are really into the Iceland thing right now. A friend of a friend Phil just got married and they honeymooned in Iceland for a week and now London. You can check out their trip here... and go back a few pages to the Iceland part. You may find some extra things to do! Hope you take lots of pics! You really deserve this vacation!